It’s the 21st Century. Getting the kind of comprehensive, professional, and comfortable dental services you deserve should be simple. With the advances in modern dentistry, there’s no reason for patients to suffer while spending time in the dentist’s chair. Pain-free dentistry is not only possible but the standard in most dental offices. So if you dread going to your current dentist because you are afraid of suffering pain, discomfort, and anxiety, it’s probably time to consider changing dentists. At McCosh Family Dentistry, we believe that no patient needs to suffer to get the dental care they are entitled to. From simple teeth cleanings and flossings to more comprehensive services like cavity fills and even root canals, our goal is to offer our patients complete comfort and a stress-free experience. In the past, a visit to the dentist could be a painful experience. But that’s not the case today. Most of our patients experience practically no pain or discomfort at all, regardless of the procedure. That same commitment to anxiety-free service extends to our office staff as well. Going to the dentist can be stressful enough. So you shouldn’t have to worry about having to deal with a hurried or inattentive staff. At McCosh Family Dentistry, you will be treated with the respect and dignity you deserve. 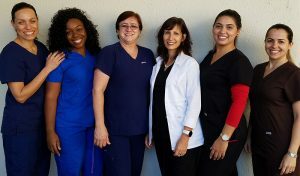 Our courteous, friendly, and helpful staff will go out of their way to ensure that you are given the finest patient service possible. We are committed to a new kind of family dentistry, one that focuses on the patient’s comfort and care. At Margate Family Dentistry, we strive to exceed the expectations of our patients with every visit. So if you currently hate going to your dentist because you are afraid it will hurt, try a new way. Call McCosh Family Dentistry and find out how patients ought to be treated.